The trailers piqued my interest, but we have all seen movies bested by their trailers. In those cases, the sum is actually less than its parts. It wasn�t until a friend touted Brother as one of the top five films he�d seen that I was convinced it was worth the 15 dollars and the risk of wasting a rare evening alone with my wife. Going in, I knew nothing about the film. I knew who George Clooney was and thought he was a good actor but had never seen him in a context that would warrant an exceptional performance. Might as well let the cat out of the bag now, everything about this film is exceptional, from the concept, script, structure, production, direction, score, and cinematography to most certainly the acting. The film centers on the main character, Ulysses Everett McGill (Clooney), and his two prison-mates, Pete Hogwallop (John Turturro) and Delmar (Tim Blake Nelson), and their adventures following their escape. The film is loosely organized on The Odyssey by Homer and set in immediate post-Depression Mississippi. As Robert Oermann wrote in the liner notes for the soundtrack, this allows for an interesting mix of classical Greek and Southern archetypes throughout the three escapees� escapades. The adventures begin with the chain gang crossing the path of a prophet who utters his oracle and sets the unfolding of the film. The prophet is an eccentric, blind, and elderly black Southern male with piercing, blank eyes. He is piloting a manually powered rail car and gives the escapees a lift. Along the way, the three encounter a congregation proceeding to a baptism in a river. Pete and Delmar enthusiastically join the procession and submit to baptism believing it to cleanse them and result in the commutation of their sentence. There is also the seemingly chance encounter with the Sirens who seduce the three under their �spell� and �turn� Pete into a horny toad. It is in these situations that the acting really shines. An actor friend of mine stated he thought the roles in Brother would be easy to overact. He is right. The fact that you actually believe Ulysses and Delmar sincere in their belief that Pete is a toad, testifies to the preciseness of the acting. The archetypes continue in a number of cameo-like appearances. All are brilliantly done. 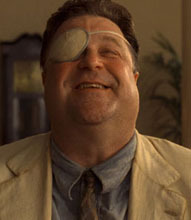 Continuing the parallel with The Odyssey, John Goodman represents the Cyclops as the patched-eye, Bible salesman, Big Dan Teague, who dupes McGill and Delmar and gains their trust only to leave them beaten and a bit poorer. Michael Badalucco (The Practice) stars as George Babyface Nelson, a notorious bank robber who�s a bit consumed with disproving the apparent charm of boyish countenance. He also leaves the wayward band with funds to continue their journey. Above all, and worth the price of admission, is the role played by Stephen Root (Jimmy James on NewsRadio). He plays the blind radio station manager who records the Soggy Bottom Boys� hit �Man of Constant Sorrows.� The recording becomes the smash hit in the Southeast. The song garners greater success when the mystery band cannot be found. Joining the trio in the recording is Tommy Johnson (Chris Thomas King). He represents the blues legend Robert Johnson who supposedly sold his soul to the devil in exchange for success as a performer. True to the legend the trio picks Tommy up at the crossroads where he waits with guitar in hand. There are several other story lines in the film including the race for the governor�s office, which adequately tells of the populism common during that time. All sub-plots weave in and out of the main theme and coalesce to produce a seamless whole. The moviegoer is never left confused by dangling story lines. Resolution is achieved for all without being artificial. Brother is a comedy but more in the Shakespearean tradition, not of the Tommy Boy slapstick vein. By this I mean the movie�s objective is more than mere laughter, a noble cause nonetheless. There is substance to the film. The mode of delivery is simply not one of solemn drama or an academic dissertation. There are the themes of loyalty in friendship, celebration, the hatred of racism, and even repentance and theism. In the midst of these, the treasure of family stood out most to this writer. As the prophet set forth in his oracle, �You will find a fortune but not the fortune you seek.� As Ulysses declares to his long, lost daughters, he is in fact the Pater Familia and a train hadn�t killed him. For Ulysses, the fortune is his family. As Tristan Gylberd has written, �Family life provides men with a proper sense of identity. In the midst of our families we can know and be known. We can taste the joys and sorrows of genuine intimacy. We can gain a vision of life that is sober and sure.� O Brother Where Art Thou genuinely makes you laugh while engaging your mind. It creates a sober awareness of the true centrality of kin. It is a delight. O Brother is bona fide. Oermann�s liner notes can be found at www.obrothersoundtrack.com/soundtrack_t.html He must be given credit also for the observation that John Goodman was a type of Cyclops. I definitely did not notice this from my viewing of the film. Grant, Karen and George, Lost Causes: The Romantic Attraction of Defeated Yet Unvanquished Men and Movements, (Nashville: Cumberland House), p. 206.